Robert Titus had told his mom that he would get a college degree. But service in the U.S. Navy and a long sales career derailed that pledge for years. 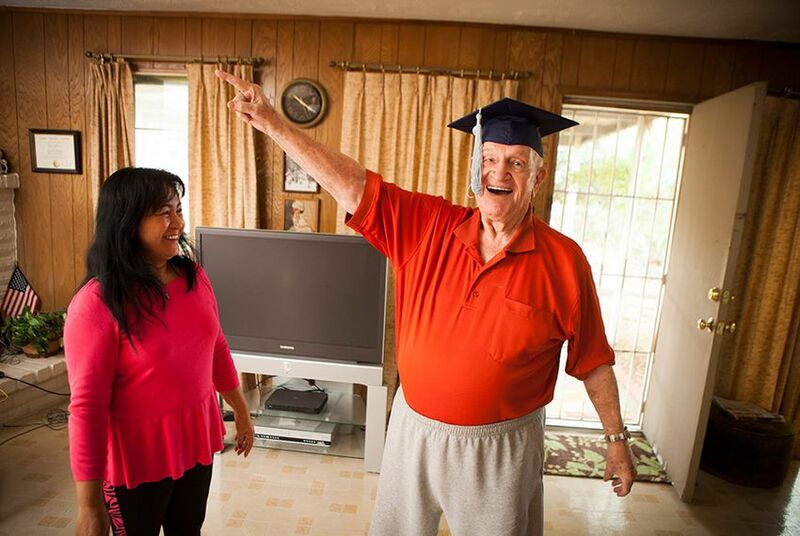 But Titus, 80, is now the proud owner of a degree from WGU Texas, an online university. But Titus has no illusions of getting hired, and he is just fine with that. After more than a decade of retirement, the former salesman is happier than ever. So why pursue the degree? By a wide margin, Titus was the oldest member of the inaugural graduating class from WGU Texas, a nonprofit online university created in 2011 with an executive order by Gov. Rick Perry. More than 440 students have graduated from WGU Texas. The average age in that group is 39, and the average time to earn a degree was about three-and-a-half years. Like many of the initial graduates, Titus was already a student of the 15-year old Western Governors University, of which WGU Texas is a state-centric offshoot. Known for allowing students to advance based on mastery of a concept rather than time in a course, the university has been touted as a flexible option for working adults. Titus first enrolled in 2006. But he was unsuccessful during numerous attempts at a more traditional college route. His first effort, immediately out of high school, was cut short when he enlisted in the U.S. Navy and served in the Korean War. Upon his return, he began a long career in sales, mostly for a rubber company. He would periodically enroll in a nearby college but never managed to stay on track. “My biggest concern was paying the bills,” he said. After retiring, he gave it another shot, but he had no desire to commute to a physical campus. After researching online universities, he enrolled at what would become WGU Texas, largely because it seemed the most affordable. The only downside of a virtual program, he said, was that you do not meet many people. But he enjoyed completing coursework at his own pace and cherished his weekly calls with Janelle Custard, of Arlington, his school-assigned mentor.